Best Friend Necklaces are the perfect choice to signify an endearing, lasting friendship between you and your best friends. A great ideal gift, you can give a best friend necklace to your BFF that represent just how you feel. 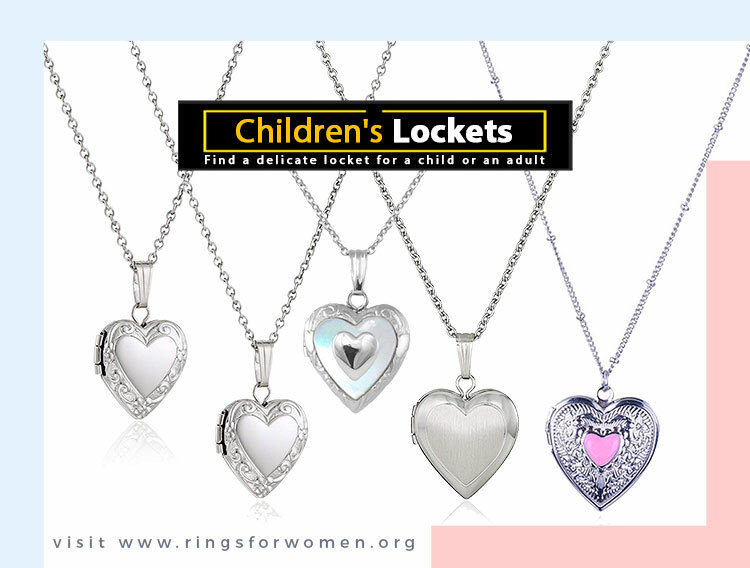 Most commonly best friend necklaces come with a pendant or charm that each best friend can share. Typical examples include a puzzle piece with 2 parts, a 2 piece break apart heart charm, and a 2 piece Ying-and-Yang pendant. While the sharing of a 2 and even a 3 piece charm is typical, you might also want to consider just giving a 1 piece pendant necklace to your best friend. A beautiful heart charm comes to mind. It is very true that one of the most important things in life is having friends. They are there for you in good times as well as the bad times, and they just make life more enjoyable. When one is lucky enough to have a best friend, one of the best ways to commemorate the special bond you share is to exchange best friend necklaces with one another. This is not a tradition reserved only for the very young, mind you. Best friends of all ages can exchange and wear cute best friend necklaces. 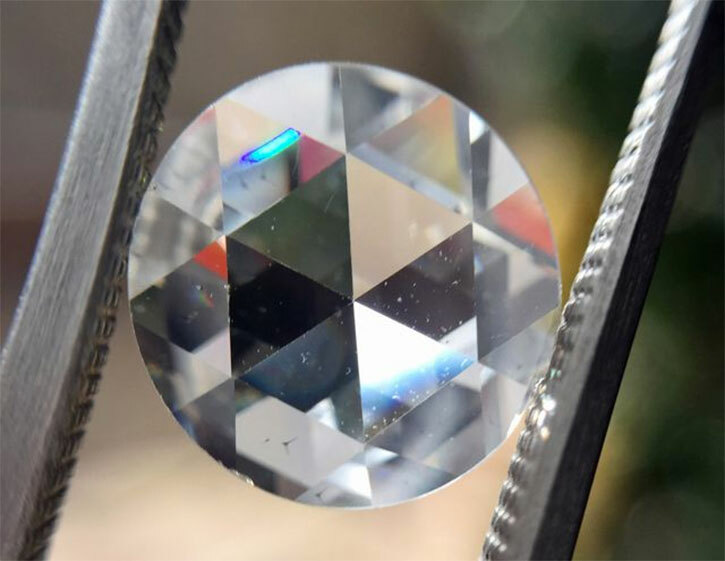 Sometimes, if both agree, the exchange can even be taken into the elegant category by exchanging more expensive necklaces with precious gemstones. 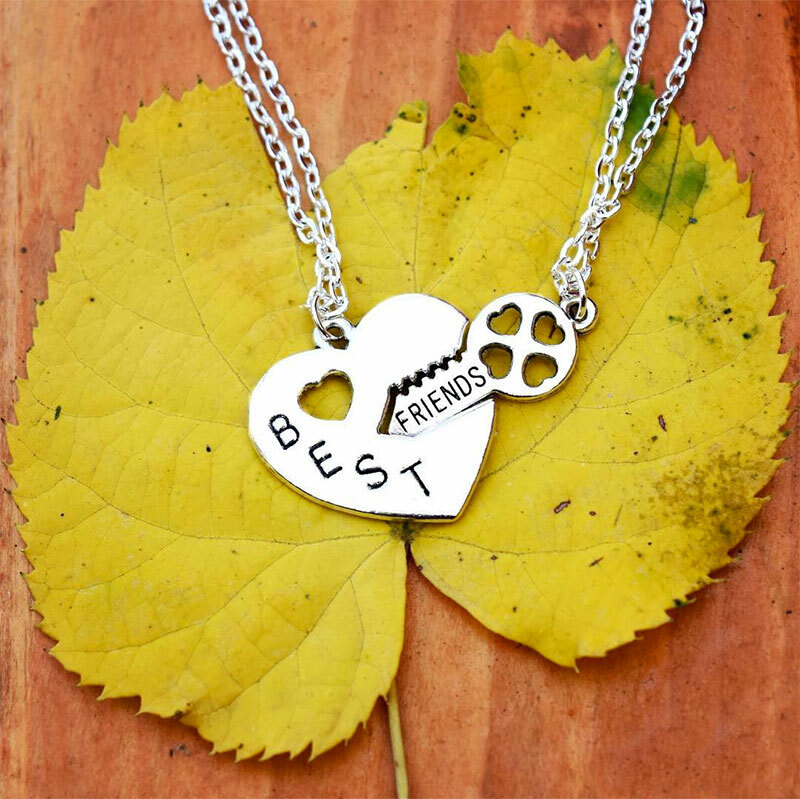 The most popular best friend necklaces are sterling silver engraved pendants, usually with a heartfelt phrase engraved on the pendant. 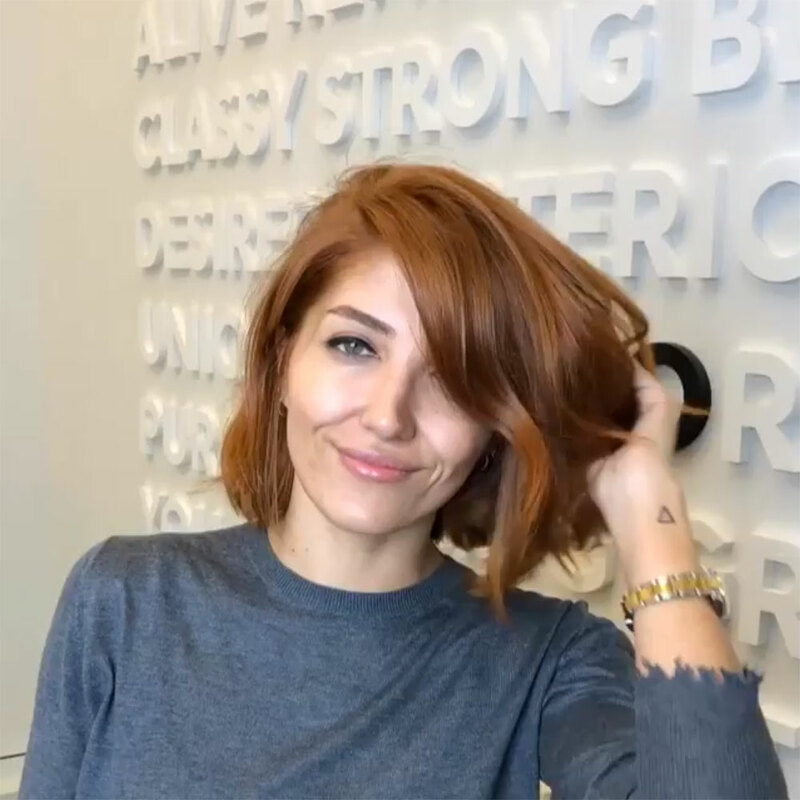 Many times, the pendants are split in two, and sometimes three parts, with a phrase such as “Best Friends” split up onto the parts of the pendant. 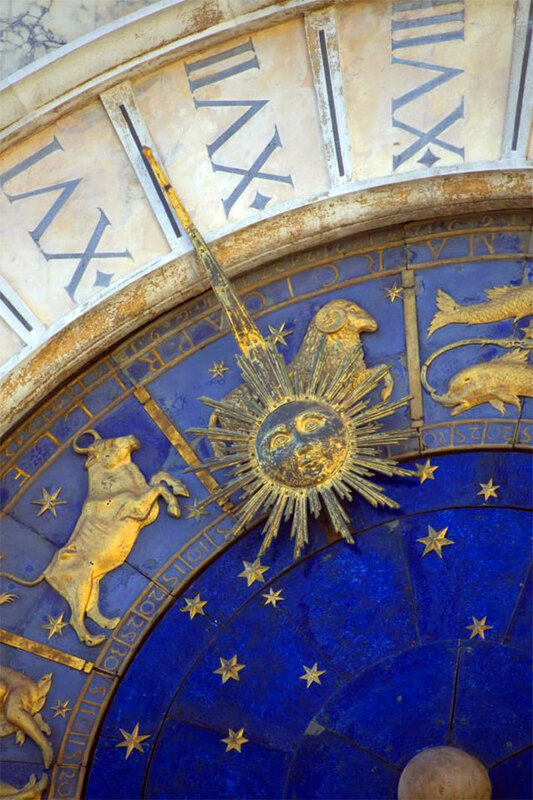 Each friend wears one part of the pendant on a chain, and when they are apart, they can just reach up to touch the pendant or look at it in the mirror, and they are instantly reminded of the wonderful friend who wears the other part of the pendant. Often the pendant shape is a heart, and each friend wears one half of the heart. Sterling silver seems to be the most popular choice of materials, probably because of its affordability and also its durability and beauty. These pendant necklaces can become personalized best friend necklaces very easily by just having the name of the friends engraved on the back of each piece. 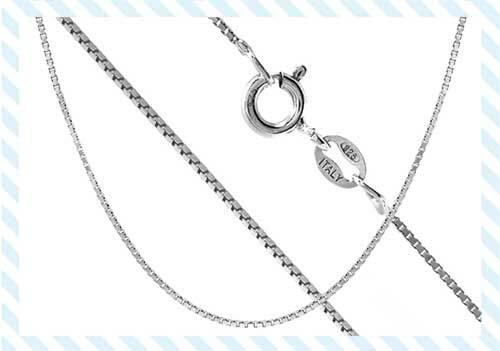 This way the necklace becomes a treasured piece of memorabilia for each friend. Puzzle piece best friend necklaces are also very popular. Two interlocking puzzle pieces, one usually sporting “Best” and the other with “Friends” are worn by each of the friends. These charming pendants come in every material imaginable, but again, sterling silver is probably the most popular, followed by white and yellow gold. There are also many pendant charms that spell out the words “Best Friend”. Each friend wears a pendant that matches or is very similar to each other. A good way to choose this type of best friend necklace is for each friend to shop for a pendant, so they are not exactly alike. The pendant chosen should reflect the taste of the buyer, and they when they are exchanged, each friend has a beautiful piece of jewelry that represents her very best friend and that will remind her of that friend each and every time she wears it. 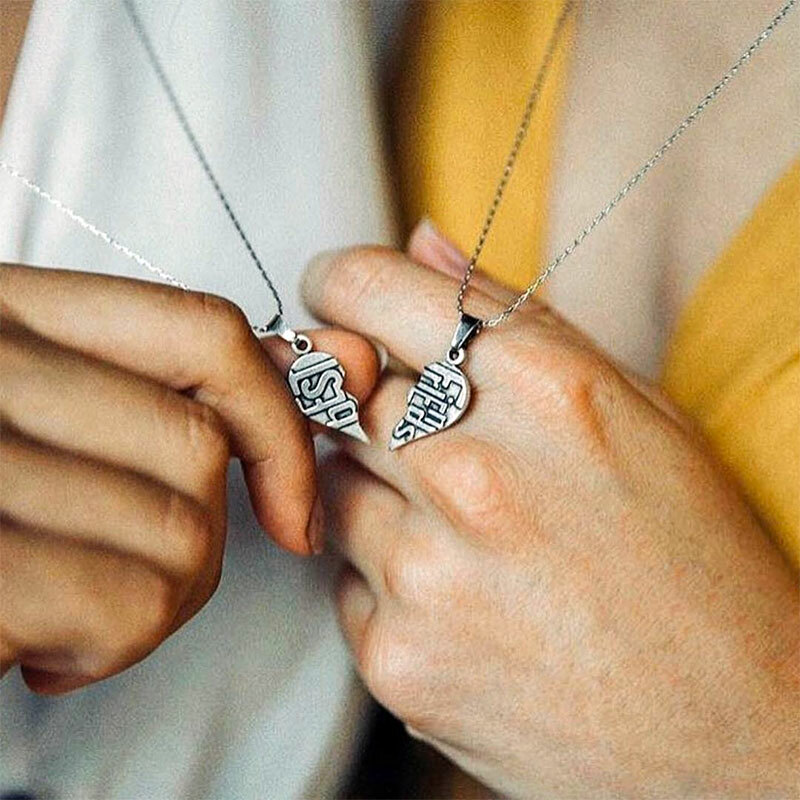 For best friends who prefer to be a bit more subtle, yet still wear a token from each other of their friendship, matching pendants can be chosen in styles such as a heart, a Claddagh, or a cross with no “Best Friend” engraving or styling on the pendants. 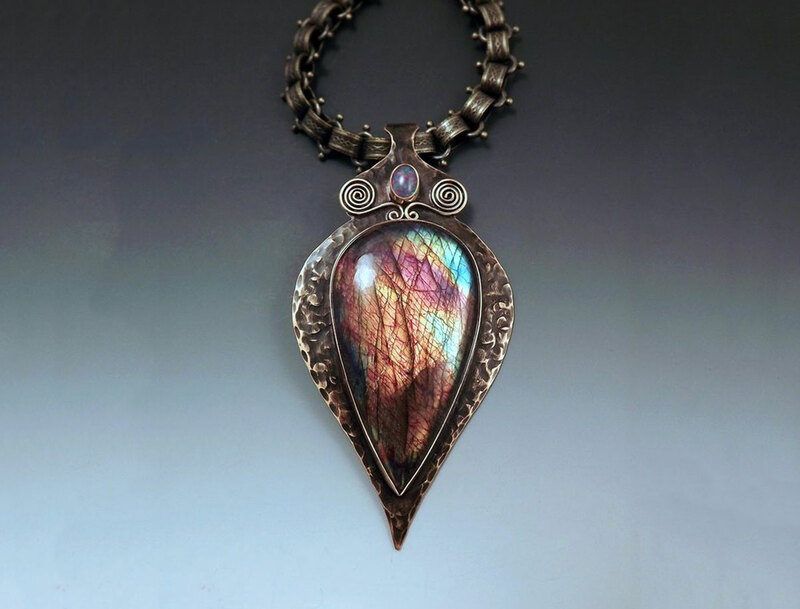 Another variation on this is that birthstone pendants may be chosen, and each friend then wears her best friend’s birthstone. No one need ever know the pendants are actually best friend necklaces. Engraving can still be done on the backs of the pendants if the friends wish to do that. 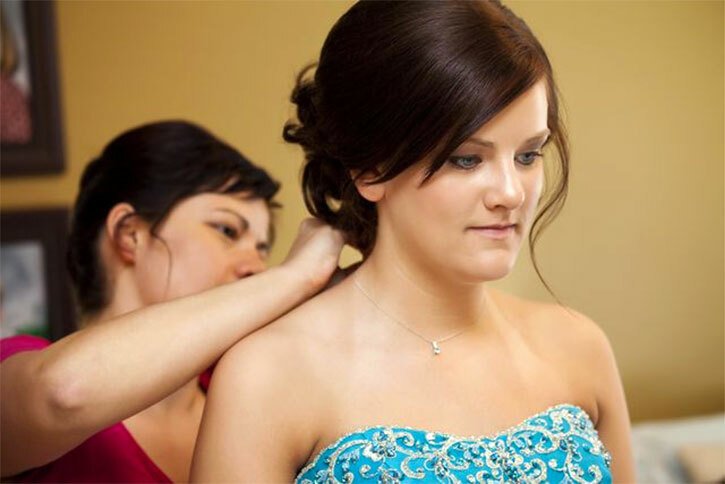 A silver or gold locket can also be chosen, and pictures or locks of hair from each other placed in them. When they are closed and worn, they are very elegant and beautiful, and only the owner knows about the treasured memento inside. As always, when shopping for jewelry that you want to last a lifetime and beyond, shop with a trusted and reputable jewelry store. Many superb stores online offer hundreds if not thousands of choices of best friend necklaces for 2 people. Just pick your basic style, decide what you want to spend, and let your fingers do the clicking to get some wonderful pieces of best friend jewelry that will be loved and worn with pride for years to come! What Prom Necklace Should I Choose?